Tooth abrasion is a progressive, pathological loss of tooth substances due to mechanical forces. Any tooth can be affected by most commonly are the canines and premolars. Unfortunately, it is a condition that can happen at any age, but it increases at the elderly age. The reason behind it is that the tooth substances suffer from wear. It all starts in the enamel, but it can progress into the dentin, and in some cases even affect the pulp. Males have a higher prevalence to suffer from abrasion than women. Canines and premolars are the two teeth groups that usually suffer from this condition because of their location. Right-handed people suffer from abrasion more often on the left side, while left-handed people are more affected on the right side. The surfaces are usually located near the gum line, are shiny and V-shaped. The most common symptom is tooth sensitivity. It mostly depends on the level of abrasion. In the beginning, patients are not able to really notice what’s happening to their teeth, but at one point the defects are more than visible. The substance loss can be really progressive and even reach the pulp. Once it does, the symptoms become worse. They include pain, and that is when treatment is really necessary. Hot and cold will really cause sensitivity and an unpleasant feeling. With the progression of the condition, patients might also suffer from periodontal disease and dental caries. 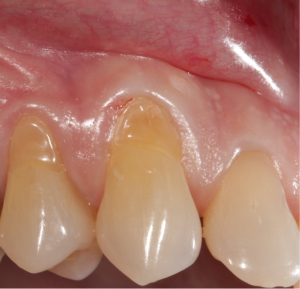 Abrasion is often associated with gum recession, especially when it’s caused by using a hard-bristled brush or an aggressive brushing technique. The reasons can be divided into several groups including habitual, toothbrush, appliances, and ritual. The main causes include improper brushing techniques and using too much force while brushing, nail-biting, using toothbrushes with hard bristles, abrasive toothpaste, toothpicks, tongue jewelry and more. Among the most common reasons, you will encounter the inappropriate brushing technique. A lot of patients are not aware that they shouldn’t use brushes with hard bristles and use excessive force while they brush their teeth. Another common factor is removable appliances. It can be both orthodontic appliances for any age, or removable dentures, usually worn by the elderly. The most important thing about this condition is to remove all the factors that can cause abrasion. With different people there is a different reason. The treatment includes removing the factor that causes the loss of substances and properly taking care of the lesions. Once that is done, the further steps include eliminating all the foods and drinks that can make the condition worse. For example, patients have to avoid bubbly drinks, lemons, limes, oranges. When it comes to oral hygiene they have to use super-soft brushes and toothpastes for sensitive teeth. Fluoride toothpastes, and other fluoride products are very useful in protecting your teeth. Once you visit the dentist, they will be able to tell you more about the treatment that is recommended for your individual case. Patients are often concerned about aesthetic part of the condition. Some teeth will require simple cosmetic procedures, while others might need to be treated with crowns or bridges.